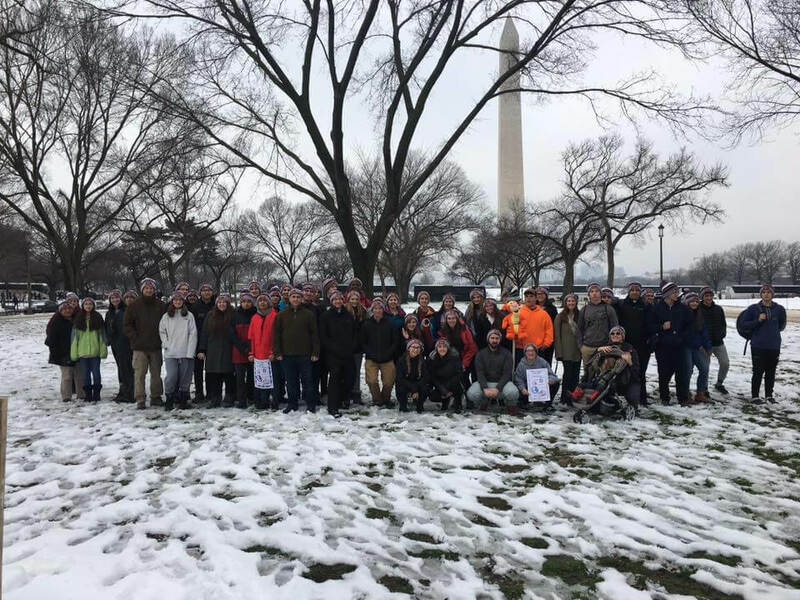 Photo Credit: Courtesy Bill Gavin - About 45 students from northern and central Vermont attended the March for Life in Washington, D.C., which began on the National Mall near the Washington Monument and ended at the U.S. Supreme Court. For newcomers to the annual March for Life in Washington, D.C., the size of the crowd is surprising. Estimates in recent years have varied wildly, from 200,000 to 650,000; this year’s version took more than two hours to move about a mile and a half from the National Mall up Capitol Hill to the U.S. Supreme Court. The march doesn’t get much coverage on television and in major newspapers, so it’s hard for people to visualize it, but it made an impression on people from the Diocese of Burlington who went last week. “Living in such a secular state as Vermont you feel like you’re the only Christian and the only one who’s pro-life and that you’re a freak for believing it. To be in a crowd of half a million people, you realize that you are the pro-life generation, and you’re not crazy for believing what the Church has always taught,” said Jordan Easley, director of religious education at St. Francis Xavier Parish in Winooski who served as a chaperone for the trip. The march commemorates the U.S. Supreme Court decision in 1973 that legalized abortion nationwide. Temperatures were in the mid forties for this year’s version, the 46th annual; clouds turned to sun about halfway through. It was a mostly joyous gathering. Bagpipes, drums, a trumpeter playing the National Anthem and a lone tin whistler standing on a snow pile on the south side of Constitution Avenue were among the informal musical accompaniment to the march. Some groups prayed the rosary while walking in the crowd. While conservatives and religious Christians accounted for many, signs announced secularists for life, feminists for life and liberal Democrats for life. Roman Catholic diocesan groups, churches and schools from the eastern half of the United States were prominent. Bill Gavin, director of youth and young adult ministry for the Diocese, led the trip, which included about 45 high school students from northern and central Vermont. He is originally from northern Virginia, and he arranged for the group to stay in classrooms at Bishop Ireton High School, his alma mater, in Alexandria, not far from Washington. That helped keep the costs of the trip down. Contributions from several parishes in the Diocese enabled some of the students to go at reduced prices or even free of charge. While the March for Life on Jan. 18 was the centerpiece of the trip, Gavin scheduled related events including visits to the Holocaust Museum and the St. John Paul II National Shrine, where they attended Mass. Students prayed the Liturgy of the Hours in the chapel of the high school where they stayed. They also visited a nursing home, performing songs and playing cards with the residents. — Matt McDonald is a freelance writer from Mashpee, Massachusetts. Links provided on this website are provided solely for the user's convenience. By providing these links, the Roman Catholic Diocese of Burlington assumes no responsibility for, nor does it necessarily endorse, the organization, its mission, content, or sponsoring/associated organizations.